"I am cantankerous, greedy, fat. I am perhaps, disagreeably, attached to power. But I am anything but insane." Focus Features has released the first official trailer for a film titled Victoria and Abdul, telling the story of an unlikely friendship between Queen Victoria of Britain and an Indian clerk named Abdul Karim. Director Stephen Frears partners with Judi Dench again, who stars as Queen Victoria (she also starred in Frears' Philomena a few years back earning an Oscar nomination), with newcomer Ali Fazal playing Abdul. The full cast includes Olivia Williams, Michael Gambon, Eddie Izzard, Tim Pigott-Smith, Simon Callow, and Adeel Akhtar. This seems like a good fall film, charming and entertaining, with a few great performances. Dench looks excellent as always, and I'm intrigued to see Fazal's performance. Worth a look. The extraordinary true story of an unexpected friendship in the later years of Queen Victoria's remarkable rule. When Abdul Karim, a young clerk, travels from India to participate in the Queen’s Golden Jubilee, he is surprised to find favor with the Queen herself. As the Queen questions the constrictions of her long-held position, the two forge an unlikely and devoted alliance with a loyalty to one another that her household and inner circle all attempt to destroy. As the friendship deepens, the Queen begins to see a changing world through new eyes and joyfully reclaims her humanity. 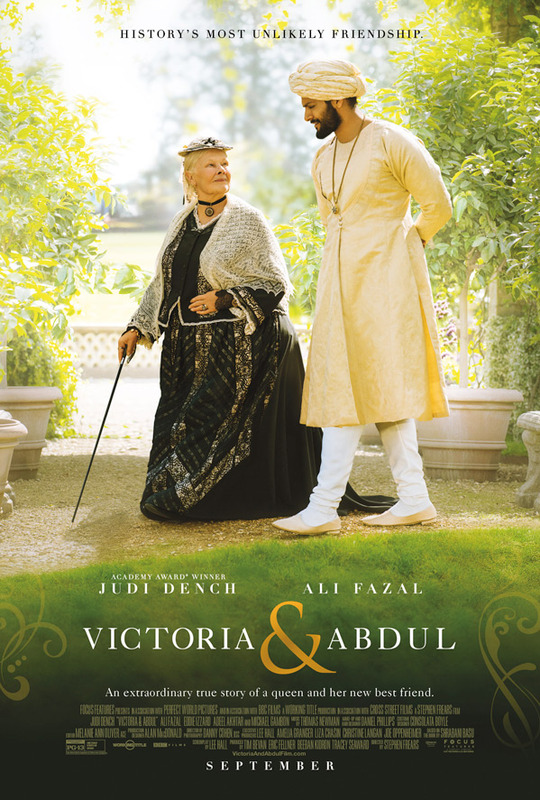 Victoria and Abdul is directed by veteran filmmaker Stephen Frears, of High Fidelity, Dirty Pretty Things, The Queen, Tamara Drewe, Philomena, The Program, and Florence Foster Jenkins previously. The screenplay is written by Lee Hall; based on the book by Shrabani Basu. Focus Features will open Victoria & Abdul in select theaters on September 22nd.